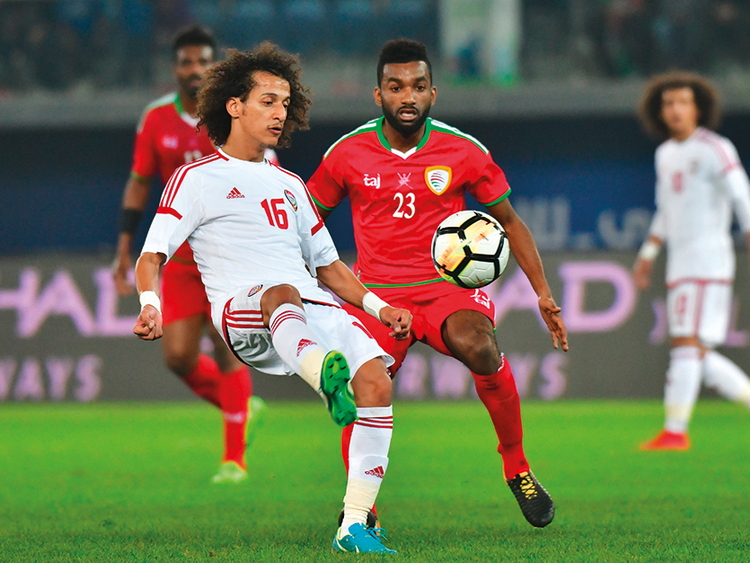 Abu Dhabi: With a semi-final spot up for grabs, a tooth-and-nail battle is on cards when the UAE take on Saudi Arabia in the Group ‘A’ fixture of the Gulf Cup at the Jaber International Stadium on Monday. The action starts at 6.30pm. Both teams come into the contest at the back of a win each. UAE won their opener against Oman 1-0 while Saudi Arabia defeated hosts Kuwait 2-1. Saudi Arabia are participating in the tournament with its second string team instead of the main team that qualified recently for the 2018 World Cup in Russia, but the young side is hungry for more. They have spent enough time on the sidelines and are keen to make their presence felt. UAE’s Italian coach Alberto Zaccheroni is well aware that his wards will have to play out of their skin to win this contest. “The Saudi team is the best among the Gulf teams and the evidenced of that is they have qualified for the World Cup in Russia. UAE had provided opportunities to three new players - Mohammad Al Menhali, Khalifa Mubarak and Ali Salmeen against Oman. Even Rayan Yaslam, who came in the second half, made his presence felt straightaway. Once again, the new comers will be under pressure to deliver against the formidable Saudi outfits but they are game for the challenge. “I did not feel intimidated by my debut at the Gulf Cup as everyone encouraged me. The atmosphere within the team was really good and there is a lot of enthusiasm in the squad,” said Yaslam, who added that the team will double their efforts in the coming matches to achieve success in the tournament. Salmeen hailed the support provided by the senior members in the team to allow them to settle in the squad with ease. “I want to thank the senior players. They supported us well and provided a positive atmosphere. The senior players’ advice was of great help. Hopefully, this will contribute to go all the way and win the title,” said Salmeen. Khalifa Mubarak was of the view that he and other new players in the team have a lot of confidence in themselves and their abilities. Meanwhile, the Technical Committee of the Gulf Cup 23 has rejected Oman’s protest against Mohamed Ahmed’s participation for UAE as he had received a red card in a friendly match with Uzbekistan in November. The Committee, after holding a meeting on Sunday under the chairmanship of Kuwaiti Hamid Al-Sheibani and in the presence of all members said that, the result of UAE’s 1-0 victory over Oman will remain unchanged. Saudi team has also been allowed to change their player Hazza Al Hazza, who suffered injury, with Hattan Sultan. On Saturday, Defending Champions Qatar beat Yemen 4-0 in their Group B first match at Kuwait Sport Club’s stadium. Coached by Felix Sanchez, Qatar scored three goals in the first 18 minutes. Akram Afif (2nd minute), Mehdi Ali Mukhtar (5th minute), Almoaz Ali (18th minute) and Pedro Miguel (84th minute) completed the tally. In another Group B fixture, Bahrain split points with Iraq by playing out a 1-1 draw. Jamal Rashed opened the score for Bahrain in the 34th minute while Muhannad Karrar equalised for Iraqi outfits in the 42nd. UAE Squad: Mohammad Hassan, Khalid Easa, Sultan Al Montheri, Mohammad Ahmad, Khalifa Mubarak, Faris Juma, Muhannad Al Enazi, Mohammad Al Menhali, Salem Al Azizi, Esmail Ahmad, Mahmoud Khamis, Mohammad Marzouq, Mohammad Fawzi, Ahmad Burman, Mohammad Abdul Rahman, Khamis Esmail, Rayan Yaslam, Esmail Al Hammadi, Ali Salmeen, Omar Abdul Rahman, Ahmad Mal Allah, Ali Mabkhout, Ahmad Al Hashemi.